We still have some time before Halloween, but that doesn’t mean you can’t start planning early! 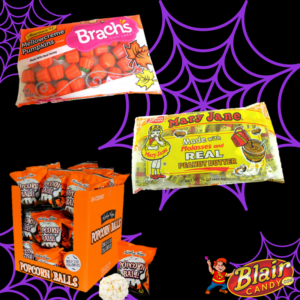 Blair Candy has all of the retro and new Halloween treats for you to choose from for a yummy candy haul. 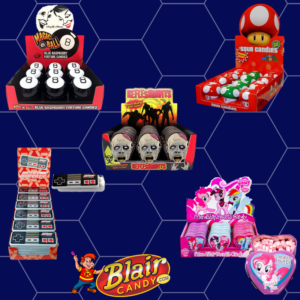 Whether you’re planning a party, passing out candy to trick-or-treaters or just want to partake in the Halloween fun, we have the candy you need. For this blog, we’ll just focus on the retro treats for Halloween. Halloween popcorn balls have been a salty, yet sweet favorite Halloween snack for a while. The big box it comes in is a great way to make sure everyone can grab one and get back to the festivities. Everyone knows about candy corn, but have you had a candy corn pumpkin? Each bite is delicious mellowcream that everyone will love. As a bonus, these are great to decorate fall desserts with too. Mary Jane candies are another classic candy that everyone should try. Each chewy molasses candy has a center of real peanut butter inside of them. If you aren’t a fan of molasses, then definitely try their peanut butter kisses for more peanut butter flavor. Wax lips are just plain fun for all ages! These wax fangs have a great cherry flavor and are ready to add to your spooky Halloween costume. Be sure to stop by BlairCandy.com today to check these and other spooky Halloween treats. No matter what your Halloween looks like, you can find the candy you need with us. Just be sure to save us one of those Halloween popcorn balls or a Mary Jane candy or two when we stop by to trick-or-treat! Popcorn is always a snack everyone can agree on. So before you go trick-or-treating be sure to snack on this this Monster Munch Popcorn Mix. Crunch popcorn, candied nuts, candy corn, and gummy worms are added in to make this a delicious and festive snack. See the recipe on A Dish of Daily Life here. If you like a cuter Halloween than a scary one, these candy cups are a must for your treat table. These chocolate cups are edible and really easy to make! Fill with jelly beans and candy corn and you have a cute decoration and snack! See the recipe on Oh! Nuts here. Finally, if you’re looking for a more traditional fall treat to go with your Halloween, these Caramel Apple Slices are the perfect addition. Your guests can still customize them, but you don’t have the hassle of trying to eat a whole apple! See the recipe on Domestically Blissful here. 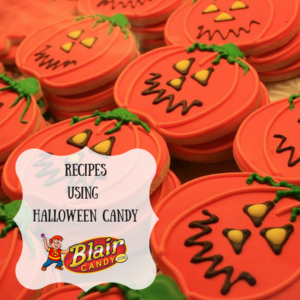 If you want more ideas, or just want to look at what Halloween Candy you’d like to hand out this year, visit BlairCandy.com! Decadent chocolate with only the finest added ingredients? Sounds like a chocolate lover’s dream! If you haven’t tried a Ritter Sport Chocolate Bar, you are seriously missing out. From a classic chocolate square, to a filled chocolate with nuts, to seasonal flavors with unique fillings, these chocolates are a true retro candy classic. What else should you know about Ritter Sport Chocolates? These are a couple fun facts about these delicious treats. The company was founded in 1912 in Germany by Alfred Eugen Ritter and Clara Ritter. Ritter Sport also had long bars, boxes of chocolate, and other seasonal products. These were gradually phased out in 1960 to focus on the square bars. Ritter Sport is a very environmentally friendly company! In the early 1990’s they switched to fully recyclable packaging and developed a agroforestry project where they get their cocoa from in Nicaragua. There is also an organic range of chocolates that are available. 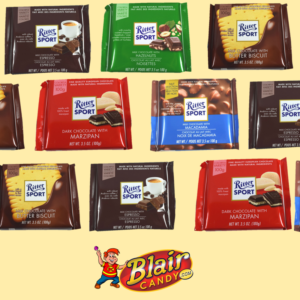 If you’re ready to try this unique and completely delicious range of chocolates, be sure to check out the Ritter Sport Chocolates on BlairCandy.com! There are plenty of flavors or this retro candy to choose from and enjoy! It’s time for fall sports! Football is starting up and everyone is ready to tailgate and watch the game together. Get ready to stock up on sports candy and try these recipes to keep everyone full and cheering on the team. Keep something sweet on hand at the game with these whoopee pies. These little football shaped pies will be a hit with both kids and adults alike. Check out the recipe on The Cake Blog here. These meatball sliders will go fast. See how to make this savory, bite sized treat on Home Made Interest here. Loaded baked potatoes and sports go hand in hand. These loaded potato rounds are easy to make and will be the perfect companion with chips and dip. See the recipe on Cucina De Yung here. Want a peanut butter treat at your game viewing party? These Nutter Butter Football players may take a little more time to make, but will make a big impression on your fans. Check out this super cute recipe on Snack Works here. 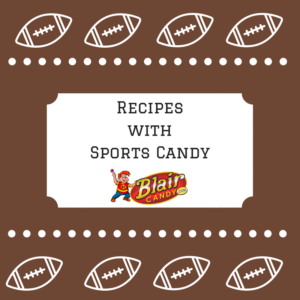 Be sure to grab up some sports candy for your tailgate or viewing party today at BlairCandy.com. You’ll find everything you need to have the best snacks and team spirit for your party. Shop now and go team! Start Planning Your Halloween Candy Haul! Is it too soon to start planning Halloween?? Never! We’re starting to stock Halloween candy that will satisfy any ghoul’s sugar craving. Here are a few candies that we think you should start enjoying before October. Shoe String Licorice will be loved by everyone at home. Kids love to play with it and adults love to eat it! Choose from grape, black licorice, pink lemonade, red licorice, sour blue raspberry, or a fruity multi flavor. Peeps aren’t just a Christmas candy anymore! Try these Peeps that are all in your favorite fall flavors. Choose from classic marshmallow monsters to caramel apple chicks. You’ll love the mix of marshmallow and unique flavors to celebrate fall. There are tons lollipops that make Halloween fun, but these will be perfect for the occasion. Choose from either a Scorpion Sucker or Cricket Lick-It lollipop to scare your guests. If your guests ask, you can proudly say that there is a real bug inside of them! Great as a prank, Halloween goody bag treat, or to stock a festive candy buffet with. 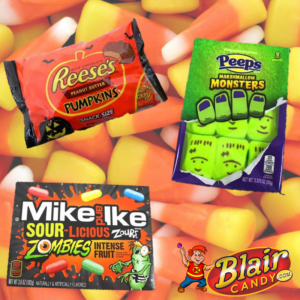 There’s plenty of Halloween Candy to choose from at BlairCandy.com. Shop traditional treats, like candy corn, to new treats like gummy candy eyeballs. Shop now and get ready for Halloween! It’s time to head back to school! Packing lunches can be fun at first, but can get pretty tiring or time consuming. Stocking up on your children’s favorite bulk snack food and candy is a great way to save time and make sure that everyone has what they like for lunch. 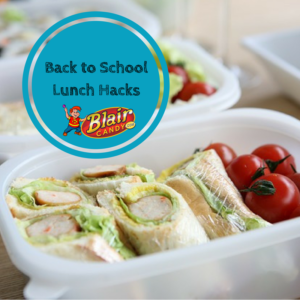 Here are some easy ideas to spice up lunch time and make it fun for everyone! Need lunches that aren’t just sandwiches? Here are tons of ideas on easy things to pack to make their lunches delicious and pretty nutritious. Check out The Pinning Mama’s recipes and ideas here. Have a child who absolutely loves PB&J Sandwiches? Make them cooler than the average sandwich with these ideas from Cooking Classy here. Looking to make your children’s Bento Box lunches colorful and fun? The Kids Activities Blog has suggestions and where to get them here. Visit these and BlairCandy.com today to make your children’s lunches the best in class. Shop all bulk snack food and candy today and get ready to go back to school! Can You Handle These Sour Candies?? Love wax soda bottle candy? Then you have to try these sour soda bottles! These Cry Baby Sour Mini Drinks live up to the name and deliver a sour experience. There are five flavors of mini sour drinks to choose from! Want a candy that gets more sour with every taste? 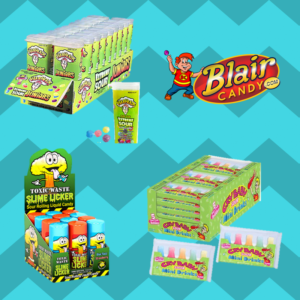 These Toxic Waste Slime Licker Pops are a sour rolling candy in two different flavors. Just roll the candy across your tongue for a sour flavor sensation! Warheads have always been the king of sour candy. Take their sour hard candies wherever you go with the Extreme Sour Mini’s flip top packaging! There are five flavors of mini candy per box for a sour snack. Find these and other bulk sour candy treats at BlairCandy.com today. Stock up on your favorite sour treat and get ready for a shock of flavor! Jordan Almonds are synonymous with weddings. If you’ve never had a Jordon Almond, they’re an almond coated in a hard candy shell. They’re usually found in pastel colors or in a shiny white. Weddings usually mean meeting new people and making good impressions. So what are you usually looking for when this occurs? A mint! Make sure your guests have a fresh breath with a sweet Butter Mint. Also called Pillow Mints, these mints get their name because they are soft and sweet. You usually know Sixlets as the colorful, round, hard shelled chocolate. But many rely on Sixlets to add a pop of color to the candy selection. Sixlets come in tons of colors and can be easily matched to the wedding colors. If you have a candy buffet at your wedding, these are a no brainer! 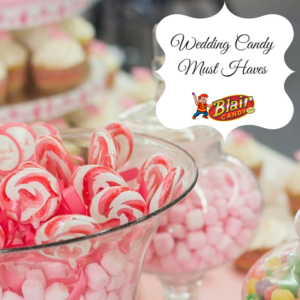 To plan your wedding candy selection, head over to BlairCandy.com! You’ll find these traditional candies plus plenty of others to satisfy your guests’ sweet tooth. 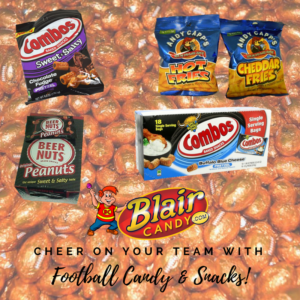 Cheer on Your Team with Football Candy & Snacks! Any snack that you can grab a handful of and enjoy is the perfect solution for watching the big game. Beer Nuts are a classic option that not only has the salty crunch you should have in a snack, but also has a sweet twist too. Combos can be sweet, savory, or both! These pretzel snacks make a great snack to pass around and keep out throughout the game. Finally, you have to have chocolate with your snacks. These chocolate footballs will make even the most serious of fans smile. Plus, since they are individually wrapped, you can use them to decorate candy dishes for festive football décor. Chips are obviously a game day must, but change things up with a bag of Andy Capp’s fries. Choose from cheesy or spicy fries for a delicious, crispy treat! For these and other football candy and snacks, visit BlairCandy.com. There you’ll find the treats you’re looking for to watch the game plus candy in your team colors. Shop now and go team!